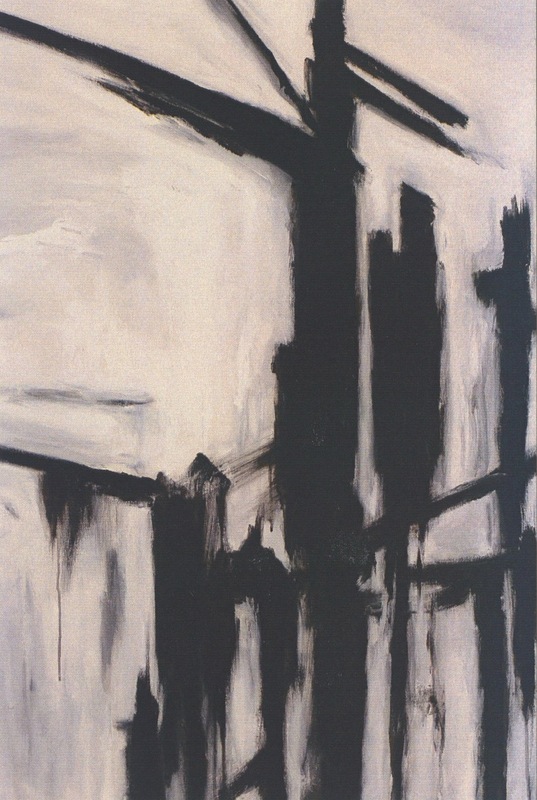 This is a painting I made in October 1998 of my first apartment in Seattle. I had left the East Coast for good, having dissociated myself from my immediate family, and resolved to start from scratch in a creative, progressive city. I was working two jobs, six days a week, and putting myself through night school in Desktop Production at the Art Institute of Seattle. 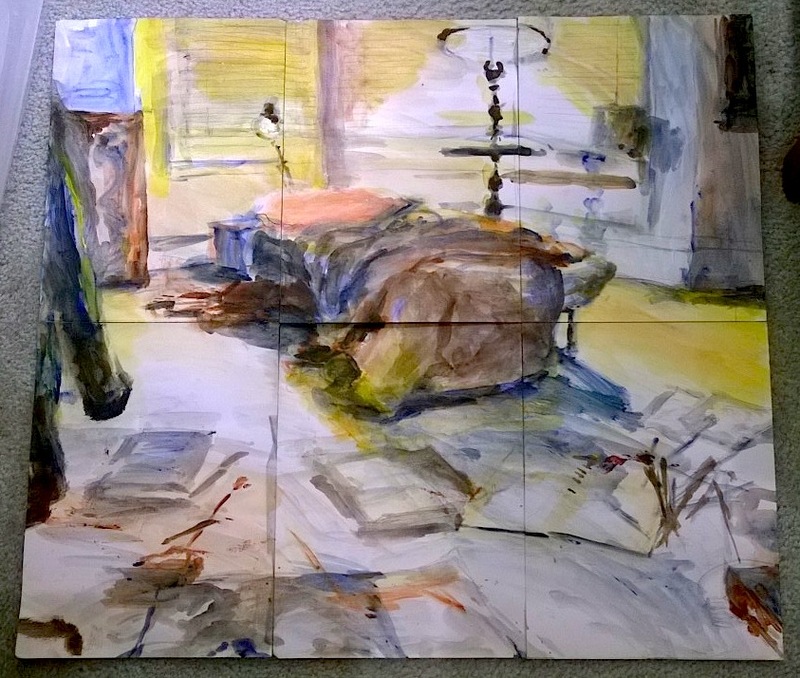 The painting shows what I had back then: a camping cot to sleep on, cardboard boxes as tables, and some secondhand furniture I’d either picked up in the alleys of Capitol Hill or borrowed from my uncle, who lived on the other side of town. The floor was strewn with used books and paintbrushes I’d brought with me from Washington, DC. The painting itself was created using the five tubes of paint I owned (the primary colors plus white and black) on several small sheets of paper taped together. It was a devastatingly lonely autumn for me. I rarely saw my uncle’s family or my one friend who lived at the far end of the city, and was disconsolate or exhausted—or physically sick—most of the time. On top of that, it rained for almost 90 days in a row, and the residents of Seattle smiled but nobody ever wanted to talk. Every day I could feel the city wearing me down like a carrot peeler would, shaving off fine slices of myself. When I think back on how hard I’ve worked for something, whether it’s attaining artistic recognition or carving out a life in this city, I get emotional. It’s hard to forget all the solitary evenings filled with bottomless longing and racked with self-doubt, the agonizing creative dry spells where nothing gets produced, the rapacious hunger for recognition and secret fear that it will come with its cruel, unforgiving gaze. You know, the typical life of an artist. 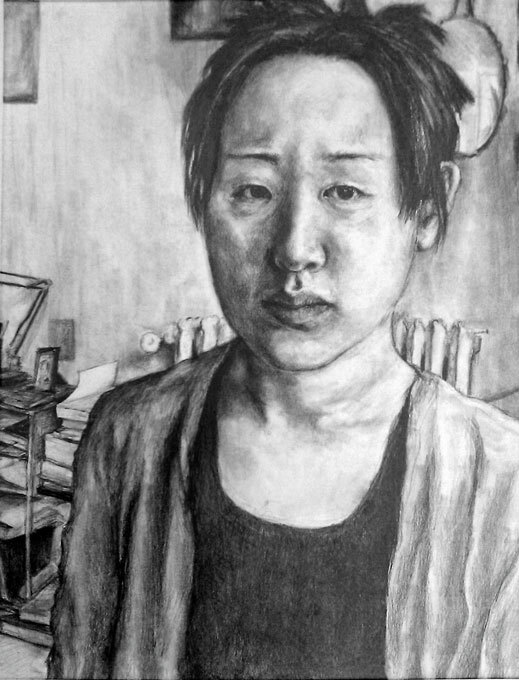 After the Wing Luke Museum solicited a piece of my art for their Korean-American show last fall, I found myself looking up one evening at the window of my first apartment in Seattle—a ramshackle Victorian building on Capitol Hill—and dissolved into tears. Trembling, I gripped myself in disbelief, feeling equal amounts of ecstasy and grief at the uphill battle it’s been. Now a dream I’ve had since June of 1999 has come true. I finally have a solo show at Zeitgeist Coffee, a well-respected coffeehouse and arts venue in Seattle’s historic Pioneer Square neighborhood. The Wing Luke Museum was a game-changer; I had professional business cards made and summoned up the gumption to invite the owner of the coffeehouse to have a look at my website. I was floored when he offered me the show. It had taken me 16 years of doggedly developing work—often spending years on a single painting—and paying my dues as an artist to get to this point. During my lunch hour a few weeks ago, I went to Zeitgeist and picked up a cellophane-wrapped block of postcards promoting my show. My eyes grew damp as I held the stack, solid as a brick, in my hands. There, printed in the familiar template used by the coffeehouse, was my name and my work. It felt like this was what I was waiting for my whole life. In the in-between light of a Seattle winter day and the squabbling of seagulls in a historic part of the city, I felt elated and strangely light-headed. Needing to return to my office, I hopped a bus that wound its ponderous way through downtown Seattle. Seated by the window, I caught glimpses of my former workplaces and apartments—all touchstones in my creative and personal development. 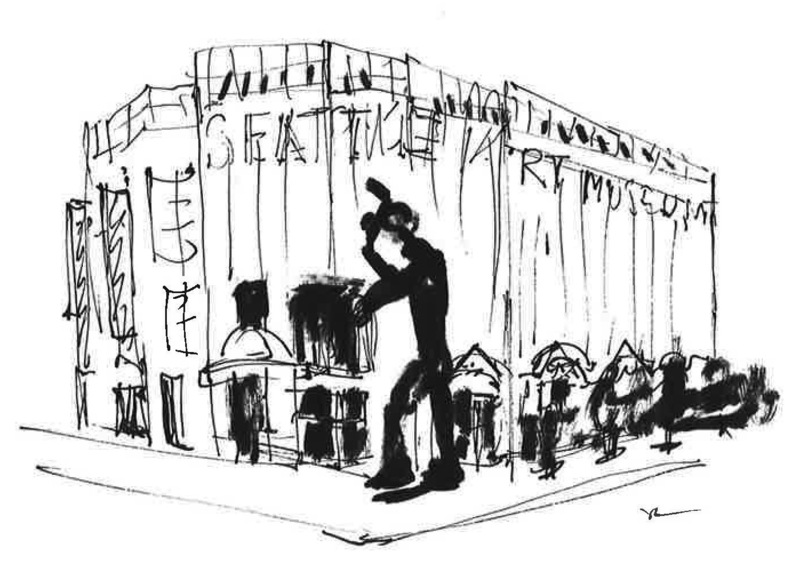 There was the Seattle Art Museum, where I’d started out in Seattle as an unhappy gift shop clerk (one of my two jobs back then); I met my husband at the loading dock in 1999 when we were working as museum security guards. Years later, he and I lived in an apartment across from the museum during its expansion and didn’t sleep for two years. The abstract paintings I’m showing at Zeitgeist emerged out of this time of insomnia and constant noise. 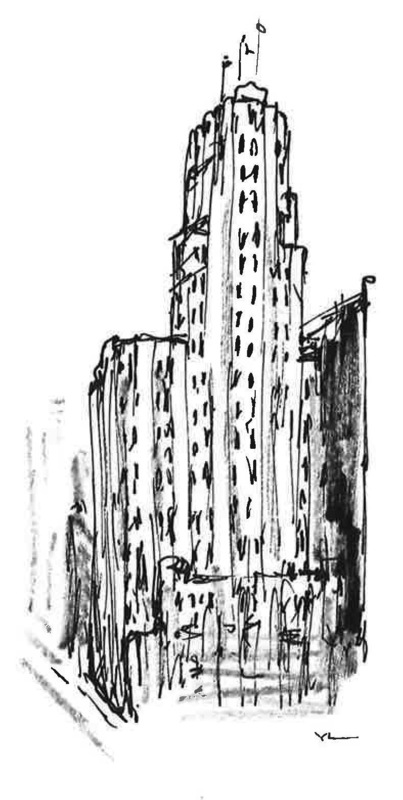 Up the road was the Art Deco–era Seattle Tower, where I spent close to seven years working as a copyeditor at a design and branding firm while creating the bulk of my abstract work. During the recession, the firm hemorrhaged people, dwindling from almost 60 employees to around 8 by the time they laid me off. I sublimated a lot of my torment and fears into my paintings. 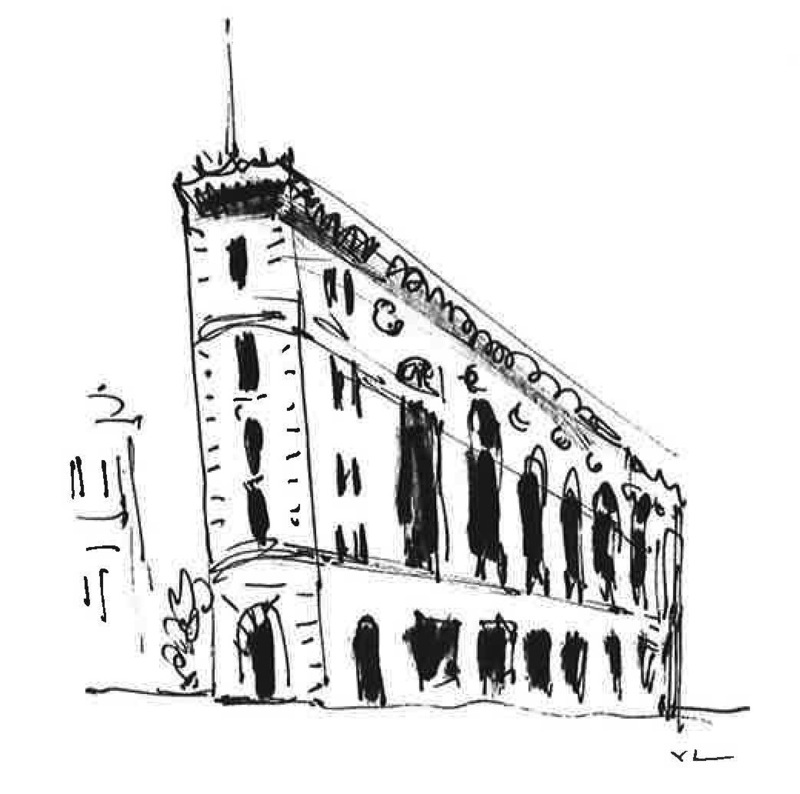 Then we passed the hatchet-shaped Times Square Building, where I had reluctantly answered phones and poured coffee as a perennially malcontent receptionist at an architecture firm. It was there that I initially developed the visual language for the paintings in my show. 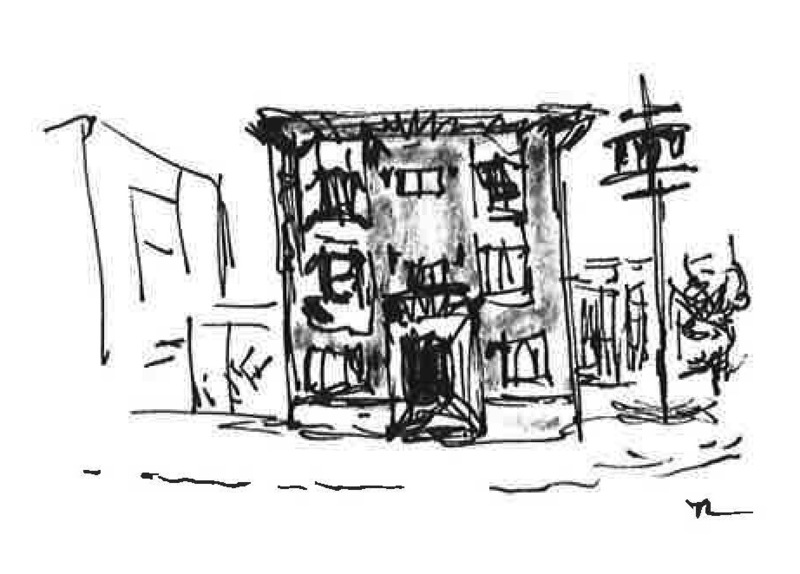 Just up the road, I could glimpse that first bleak little apartment building on Capitol Hill. That was where, as a nobody in this city, I resolved to stay and make a life here, no matter what it took. And, disembarking near my office, I remembered the first two solo shows of my work that were held a few blocks away, and how one was even reviewed in the print issue of The Stranger, a Seattle weekly paper. The bus ride was a retrospective experience that made me realize how far I’ve come. But it also reminded me of how ephemeral art shows and public recognition are. When it comes down to it, the act of creating is what empowers and drives an artist forward. So once this upcoming show has passed, I’ll soon be laboring over the next piece of creative work. But hopefully there’ll come a time when I can look back again and feel a deep, almost debilitating, tremor of gratitude. 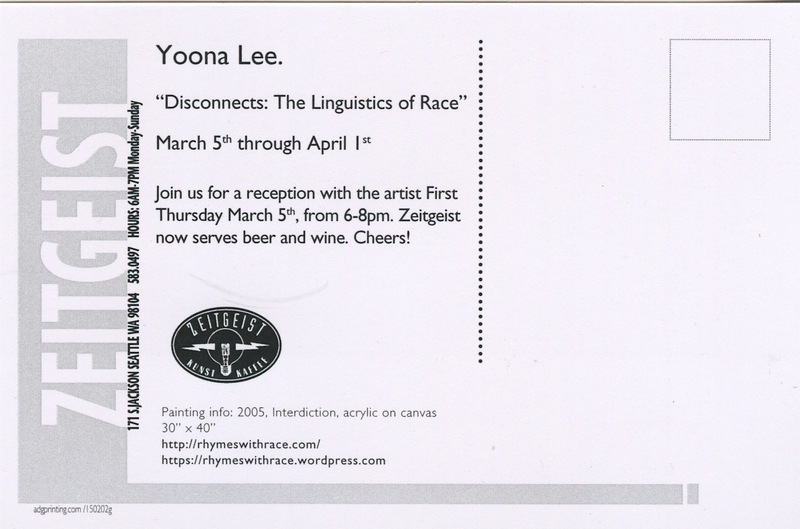 Here’s information on my upcoming art opening. If you’re in Seattle, I hope you’ll consider stopping by. Show ends April 1, 2015. UPDATE: My next show, Run Race Ragged: Three Takes on Racial Politics in America, opens at Ghost Gallery on May 12 and runs through June 5, 2016. UPDATED UPDATE: My art made it into Sotheby’s NYC, and will be on display in the AD ART SHOW on Feb. 22 through Feb. 25. So proud of you Yoona! Way to go! You deserve this and so much more!! Next up -Seattle Art Museum! The Times Square Building, where I poured my own coffee and met a self-described perennially malcontent receptionist, although I truly didn’t think that of her. Glad you could use that time productively, Yoona! Aww, so glad we could still maintain our friendship after all these years, Sam!